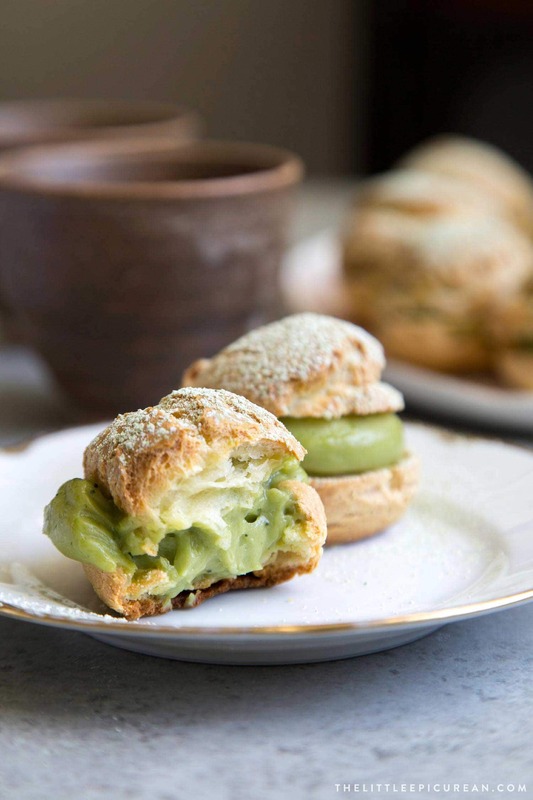 These Matcha Cream Puffs are filled with matcha pastry cream and dusted with matcha powdered sugar. It’s best to eat them fresh the same day they are assembled. The matcha dessert saga continues. Last week, I shared the recipe for these matcha madeleines. 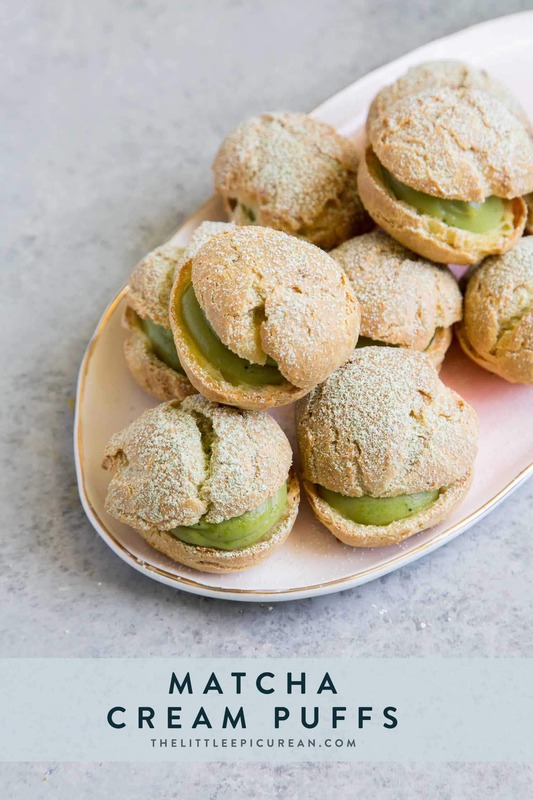 Today we are exploring the wonderful world of pâte à choux with these matcha cream puffs! During college, I was obsessed with Beard Papa’s cream puffs. Fortunately, there was a location very close to campus. Back in the early 2000s, there was only a handful of rotating flavors: vanilla, chocolate, and matcha. Nowadays, Beard Papa’s offers a larger variety including fun flavors like cookies and cream, mango cream, and even creme brûlée puffs. This is an ode the classic green tea cream puff. These profiteroles are filled with homemade matcha pastry cream. Remember to choose your matcha powders carefully! Read up on my matcha powder tips and suggestions. 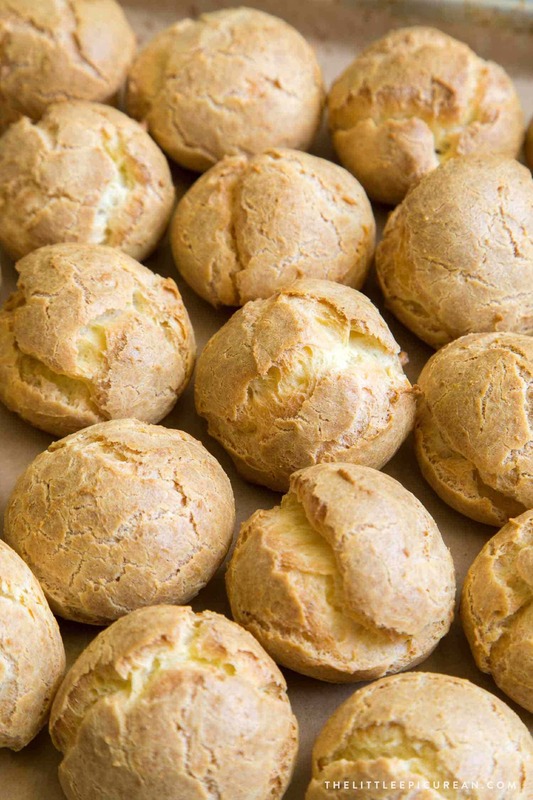 WHAT IS PÂTE À CHOUX? 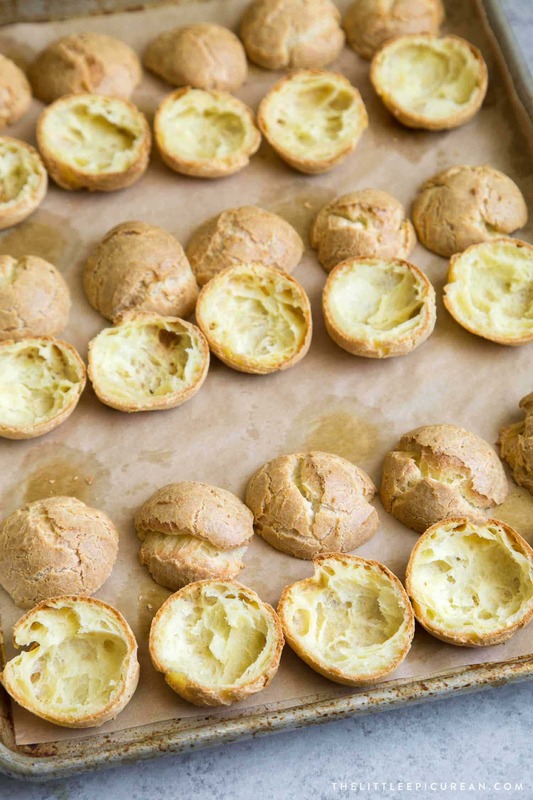 Pronounced “pat-ah-shoe,” pâte à choux is a French pastry dough that is cooked twice. The dough is first blended together over the stove, and then baked until hollow and crisp. Pâte à choux is also called choux pastry or choux paste. This dough is used to make a variety of pastries including: eclairs, profiteroles, and gougeres. 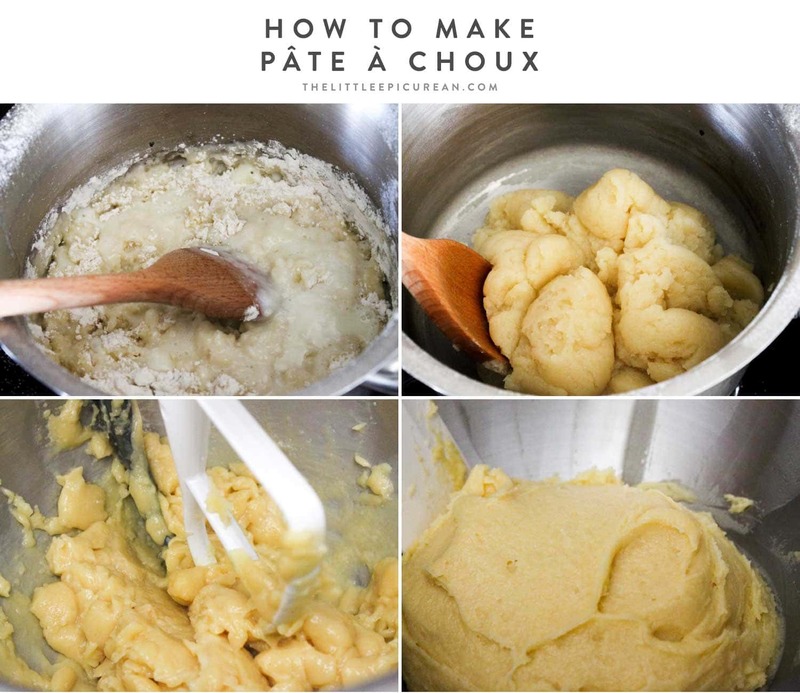 Very few ingredients are needed to make pâte à choux. The dough is made by boiling together milk (or water), butter, salt, and flour. Eggs are added and beaten in until the batter is a smooth and thick paste. 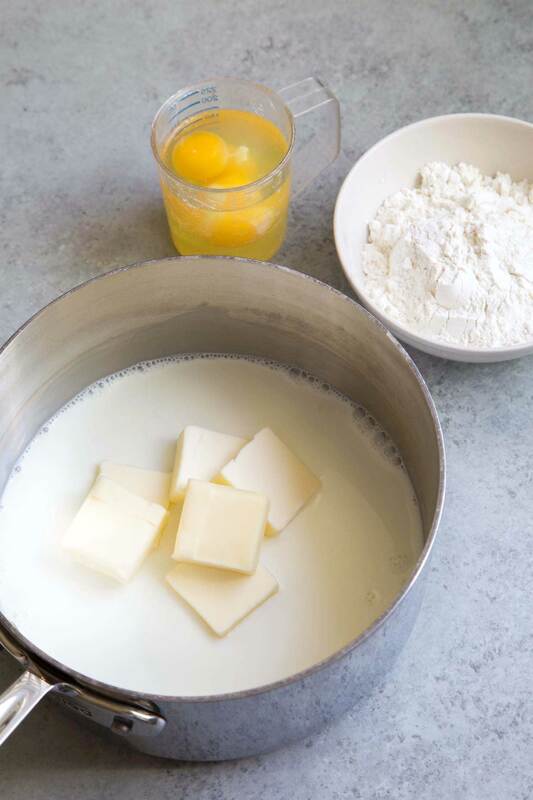 Milk, butter, and salt are melted together over the stove. Flour is added and quickly stirred in. The mixture will start off lumpy, but with constant stirring, the dough will eventually smooth out. The dough is stirred together over medium heat. This part takes a bit of effort. Continue to mix the the dough until it forms a cohesive ball that pulls away from the sides of the pot. Transfer the hot dough to a stand mixer fitted with a paddle. The dough will be VERY HOT. Beat the dough on medium speed to cool it down. Don’t be alarmed when the dough starts to steam. Once the dough has cooled to room temperature, add the eggs one at a time. This will loosen the dough, making it look curdled. After a few minutes of mixing, the dough will come back together and from a smooth, shiny, thick paste. At this point, the pâte à choux is ready to be piped or scooped. Pâte à choux is traditionally piped. It is piped into mounds to create gougeres and cream puffs. Or, it is piped into long lines to form eclairs. It is also piped into rings to make paris-brest. For a quicker and much simpler method, use a cookie scoop (or ice cream scoop) to portion out of the dough. This lends to more consistent and uniform results. I used this medium cookie scoop (size 40). Using this size scoop will produce 2o cream puffs. Profiteroles or cream puffs should be crisp on the outside, yet soft and airy on the inside. It should feel light in weight when you pick it up, like a little pillow. Ideally, the baked profiterole should have a hollow interior. During baking, the steam created from the moisture in ingredients helps to leaven the pastry dough. If the baked profiteroles feel “heavy” in weight, continue to cook them until they feel light. There are two ways to stuff cream puffs: 1.) inject with filling using a piping tip, or 2) slice off the tops and spoon in the filling. With the first method, the filling is a mystery until you bite into the cream puff. However, I prefer the second method. Simply slice off the top 1/3 of the cream puff. 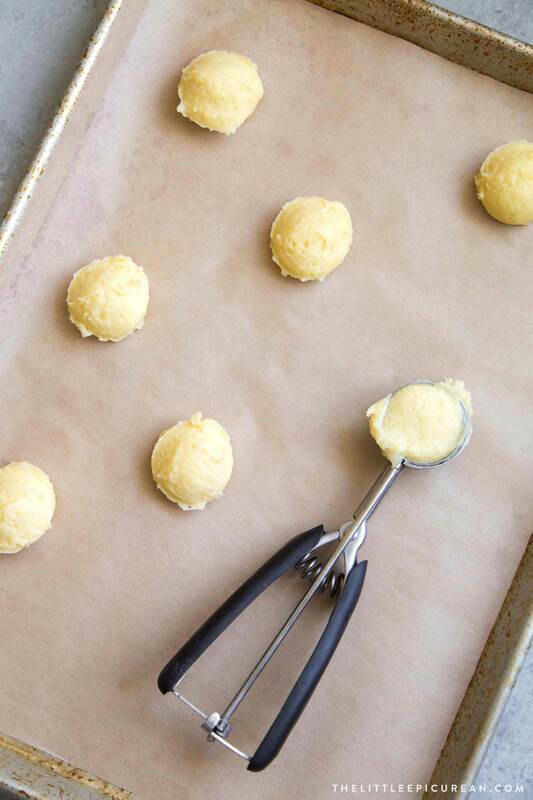 Using a piping bag, small cookie scoop, or two spoons to fill the bottom portion of the cream puff with filling. 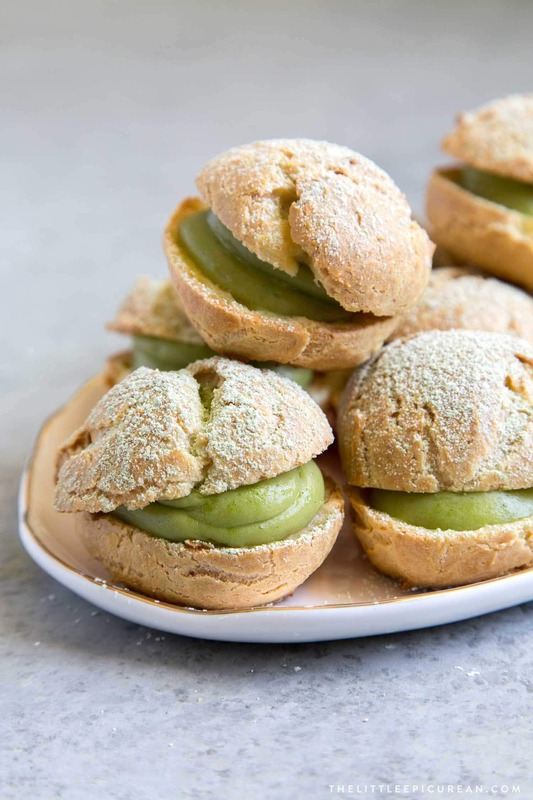 These matcha cream puffs are best served the same day they are assembled. 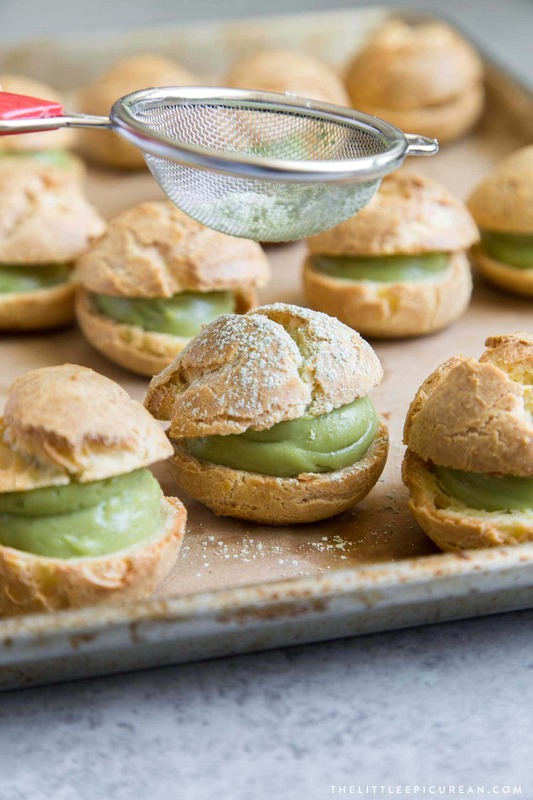 Dust the filled cream puffs with matcha powdered sugar before serving. Store any leftovers in the fridge for up to two days. Over time, the pastry cream will soften the cream puff. The cream puff will lose it’s crisp exterior, but it will still be delicious! Pressed for time? 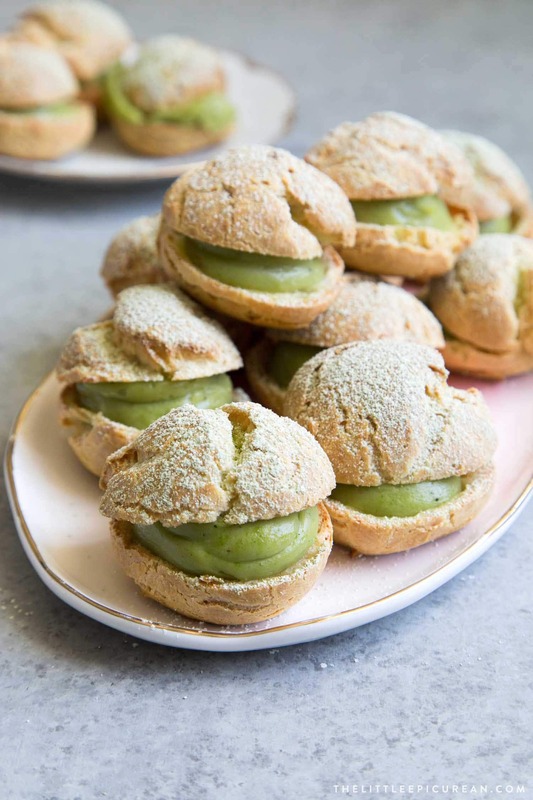 These matcha cream puffs can be made over several days. Day 1: Make the pâte à choux and bake the cream puffs. Allow to cool completely. Store at room temperature. Day 2: Cook matcha pastry cream. Fill the cream puffs, or store the matcha pastry cream in the fridge. If storing pastry cream, beat with a whisk or electric hand mixer before using. Day 3: Re-crisp the cream puffs in a 350 degrees F oven for 5-7 minutes. Fill with matcha pastry cream and enjoy! Profiteroles filled with matcha pastry cream and dusted with confectioners' sugar. It's a sweet treat you can enjoy all year long. Line a half-sheet baking pan with plastic wrap, ensuring the sides of the pan are also covered. Set aside. In a heavy bottomed sauce pot, combine milk and 1 tablespoon of sugar. Set over medium-high heat and bring to a simmer. Meanwhile, in a large bowl, whisk together remaining sugar, cornstarch, and egg yolks. Once milk is almost at a boil, slowly add milk to egg mixture about 1/4 cup at a time. Whisk as you add milk to distribute heat and prevent the eggs from curdling. Continue to add milk and whisk until there are only a few tablespoons of milk left in the sauce pot. Then pour all the egg-milk mixture back into the sauce pot. Reduce stove heat to medium. Constantly stir mixture until the custard has thickened. Keep mixing until custard has come to a boil. Remove from heat. Add butter, salt, and vanilla. Whisk until smooth. Add in sifted matcha powder and mix until well combined. Pour the hot pastry cream into the prepared plastic wrapped sheet pan. Spread evenly into a thin layer. Cover with plastic wrap and freeze for 10-15 minutes until pastry cream has cooled to room temperature. Remove from freezer. Transfer pastry cream to an airtight container and keep chilled in the fridge until ready to use. *Before using, give pastry cream a good whisk or use an electric hand mixer to beat pastry cream smooth. Preheat oven to 375 degrees F. Line baking sheet with parchment paper or silicone baking mat. Set aside. In a medium sauce pot, combine milk, butter, sugar, and salt over medium heat. Bring mixture to a boil. Add sifted flour and stir to combine using a wooden spoon or sturdy silicone spatula. Continue to heat and bring to a boil as you continually stir dough. Keep stirring until dough pulls away from the sides of the sauce pot. Once the dough is a smooth, cohesive ball, transfer dough to the bowl of a stand mixer fitted with a paddle attachment Beat at medium speed until the dough has cooled to room temperature. Do not be alarmed when the dough steams! When dough has cooled, add the eggs one at a time. Make sure egg is incorporated before adding the next egg. Scrape down bowl as needed to ensure thorough mixing. The batter will loosen and look curdled at first. Continue to beat until mixture is shiny, thick, and smooth. Transfer batter to a piping bag fitted with a 16mm plain round tip. Pipe 2-inch rounds on prepared baking sheet. Alternatively, use a medium cookie scoop to portion out batter. Place dough mounds at least 1-1/2 inches apart. Bake in preheated oven for 20 minutes. Lower oven temperature to 325 degrees F and bake for another 20-30 minutes until profiteroles feel light in weight. Allow profiteroles to cool. Once profiteroles are cool, slice off the top 1/3. 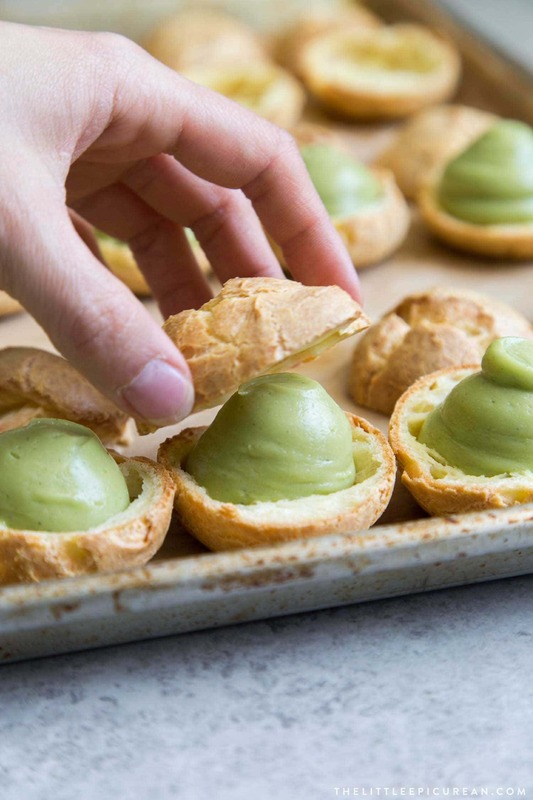 Use a pastry bag, small cookie scoop, or two spoons, fill the bottom cavity of profiterole with matcha pastry cream. Place cut piece back on top of filled profiterole. Repeat with remaining profiteroles. Dust with matcha powdered sugar before serving. To make matcha powdered sugar mixture: whisk together 2 tablespoons powdered sugar with 1 teaspoon matcha powder. Sift over assembled matcha cream puffs. I used this size 40 medium cookie scooper.